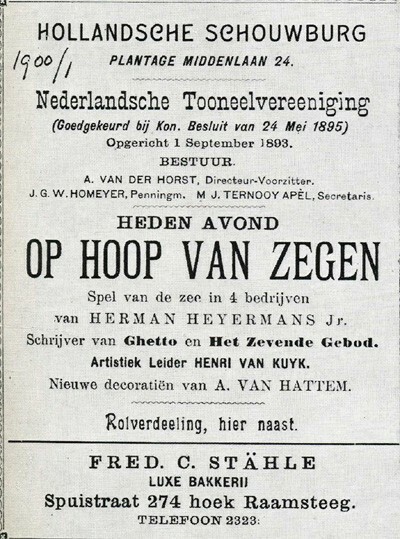 On 11 March, the play Op Hoop van Zegen by Herman Heijermans, was played by Het Toneel Speelt, in the city theatre of Utrecht. This big theatre was almost sold out. After the about two hours of the play, the audience gave the actors a standing ovation. The socialist Herman Heijermans (1864-1924) was the best known Dutch playwright of the twentieth century. His Op Hoop van Zegen, from 1900, translated into English as The Good Hope, about ship owners of the Dutch west coast exploiting fishermen, with lethal consequences, is probably his best known play. It has been played from New York City in New York state to Moscow in the Soviet Union. In the play, the rich man Clemens Bos owns vessels; including the Op Hoop van Zegen, an old decrepit fishing ship, which Bos wants to sail, preferring profits to his workers’ safety and lives. As Bos can make money if the ship is lucky, and it returns with fish. And Bos can also make money if the ship is unlucky, and he will get insurance money (somewhat like in the English slave trade, as depicted by William Turner). Later in the play, the Op Hoop van Zegen sinks to the bottom of the sea, taking the fishermen aboard with her. Heijermans’ play was recently played to Senegalese fishing communities’ audiences, who reacted enthusiastically. Cotterink’s teacher insisted that she should get Op Hoop van Zegen at the library. Probably an outdated play, she thought. However, as she started to read, she got ‘goose pimples’. Especially from the dialogue between [fisherman] Geert and shipowner Bos; in which Geert represents the workers and shipowner Bos the capitalists. The dialogue looks at both sides: the fisherman who has to work very hard and the owner who wants to cut costs. As I read that, I thought: it would be great to show that in Senegal. Director Jaap Spijkers downplays Heijermans’ socialist tendency somewhat. Too much emphasis on that would make the play less deep than it really is. Also, the abuses described in the play do not exist any more in this country. Indeed, in the history of class societies, including the history of capitalism, the forms of oppression and exploitation change constantly. However, that is different from saying that oppression and exploitation have stopped, as NRC Handelsblad would like us to believe. Indeed, fewer Dutch fishermen die now at sea than in 1900. Because the labour movement has managed to wrest some concessions from often unwilling bosses (Heijermans’ play, according to Dutch fishermen, also was a factor in diminishing the number of fishermen dying at sea). Concessions which bosses, in the fishing industry, as in other industries, will try to roll back; for instance today, saying there is an economic crisis, and, supposedly bosses and workers are in the same boat, so workers should give in, etc. Fewer Dutch fishermen die now at sea, because having emptied the European seas of most fish, industrial fishing trawlers are now targeting other continents, like Africa. They prefer exploiting local fishermen to bringing, eg, Dutch workers from thousands of miles away. And, worldwide, the fishing industry today is still the industry where most workers are killed at work. As working at jobs is also more deathly today than either [non governmental] terrorism or traffic. Worldwide, 2 million are killed by work each year. Dutch theater critic Wijbrand Schaap suggested that people who feel that writing and performing about exploitation of fishermen is outdated, might think instead about twenty-first century bankers. Concluding my argument against NRC Handelsblad: Heijermans wrote his play, inspired by the village [then, fishing village] Wijk aan Zee where he lived. Only one shipowner, his daughter, his bookkeeper, a shipyard worker and a few (ex-)fishermen and their girlfriends, wives, and widows, have roles in the play as played in Utrecht (Heijermans’ original text has a few more small roles, left out in the Utrecht performance). Yet, Heijermans intended this play, focused on one village, as a metaphor for the whole fishing industry in the Netherlands. More: the play is a metaphor for capitalism, with its exploitation and oppression, in all industries, and not just in the Netherlands; and not just in the year 1900. This exploitation and oppression have changed since 1900; but not stopped. This is why Senegalese fishing communities of the twenty-first century like the play so much. Already at the time of the premiere in 1900, but also today, socialists, like Heijermans, have admired Op Hoop van Zegen. Also non-socialists have praised the play. Not just the socialist De Visser admired Op Hoop van Zegen. So did Lodewijk van Deyssel. This art critic, literary critic, and novelist had played an important role during the 1880s literary avant-garde movement. But when in the 1890s, some people in that movement, like poet Herman Gorter and poetess Henriette Roland Holst, wanted to renew not just literature, but also society by socialism, he opposed them. That, according to Van Deyssel, was reality, making Op Hoop van Zegen great art. So, both De Visser and Van Deyssel praised Heijermans as a fellow ‘realist’. A concept originating from French painter Gustave Courbet; who was also a socialist. Today, quite some art critics take their dislike of “socialist realism” as practiced in the 1930s Soviet Union, out on different “realist” art from other times and other places. Not so in the early 1900s: both the socialists Heijermans and De Visser, and the anti-socialist Van Deyssel supported realism. They differed, however, on whether reality was essentially class society, changeable by human activity. Or whether it was determined by Fate and Nature, not changeable by human activity. Changeless fate, and the eternally dangerous sea; not human capitalists, were supposedly the problem in Op Hoop van Zegen, according to Van Deyssel (and the 21st century Dutch language Wikipedia). Basically a religious view, though Van Deyssel no longer believed in the Roman Catholic Christianity of his youth. Christians believe in a basically good God. Van Deyssel, somewhat like Greek or Roman pagans who believed in a tychè or fatum power stronger than the Olympian gods, had a more impersonal and less optimistic religion. Ultimately, not human beings, but supernatural force is supposed to rule human society. “I’m supposed to have written an epic of misery. You overlook that misery, you indulge in “the excellent literature” inspired by these horrible situations. 109 years later, Takken in NRC Handelsblad now echoes Van Deyssel then, in trying to detach Heijermans’ artistic value from Heijermans’ socialism. They differ in the why: NRC Handelsblad claims there has been change, eliminating exploitation and oppression. While Van Deyssel claimed that change was impossible; that exploitation and oppression cannot be eliminated. And Geert had died. The unspoken, but real comment by Heijermans and 1900s socialist admirers of the play to Van Deyssel and Takken would have been that, now that Geert and Barend were dead, others, still alive, would have to make the change which Geert and Barend fought for. As already starts to happen in the last part of the play. As Jo, girlfriend and now widow of Geert, regrets her past of teasing Barend and flirting with shipowner Bos, and calls the Bos family “vipers”. This is a video of a rehearsal of Op Hoop van Zegen by Het Toneel Speelt. A rehearsal of a scene between Kniertje and her youngest son Barend. Kniertje had, years earlier, lost her husband and two older sons to the fishing industry. Now, she had lost her last two sons; as Barend had predicted. Her last words, concluding the play, are “De heren. De heren”.”The gentlemen”: a devastating judgment on not just the individual shipowner Bos, but on capitalist society as a whole. For the 2009 performances, director Jaap Spijkers had not really changed Heijermans’ language. He did make the play a bit more compact by doing away with some of Heijermans’ minor characters, like the wives of shipowner Bos and of the burgomaster. The booklet of Het Toneel speelt, about their Heijermans performance, does not mention the word “socialist” once (though their more extensive Internet site does). – The idea that exploitation, oppression, capitalism, are supposed to have stopped; already discussed in earlier paragraphs; claiming that social democratic politicians are right in doing away with the anti-capitalist past of their parties. If that really is Spijkers’ reason for the change in the characterization of shipowner Bos, then that would certainly not be an improvement. That Heijermans gave the un-clement, money grabbing, character Bos, the Christian name “Clemens” is sarcasm. Especially now, with the capitalist world crisis, the worst since the 1930s, strong criticism is needed. Not literally identical criticism as Heijermans’ criticism; but certainly not less sharp. – The idea: “The real problem is not an individual like Bos, but the capitalist system.” That idea, as I have noted, is already in Heijermans’ text, and emphasizing it is an improvement. Here, I make a comparison with Surinamese historical novelist Cynthia Mc Leod. In her book on the eighteenth century free black woman Elisabeth Samson, she describes many slave owners who are “evil” persons. And also some slave owners who are “good” people; like Elisabeth and her brother-in-law. However, finally, this difference is not as significant as it seems, because the problem is slavery as a system. For instance, in Mc Leod’s book Elisabeth has the chance of buying an elderly woman, who used to be her plantation slave. Soldiers have captured this ex-slave with maroons; and the old woman may get the death penalty. Elisabeth does not use that chance to save her ex-slave’s life. In literature about nineteenth century Russia, there are quite some landowners who are not really evil people; however they still play their assigned role in a society based on exploitation of peasant serfs. Something of this question is put by Heijermans in the character Clementine, the daughter of Clemens Bos. She basically stands for the belief that hard-line capitalism can be reformed into capitalism with a human face. Unlike her father, she is more interested in art than in profit-making. She is interested in (ex) fishermen and their female relatives as subjects for her drawings. She is interested in hearing their “stories”. Kniertje, the fisherman’s widow, replies: “Ah, Miss, fisher folk lives are not stories. They are harshness”. Clementine rebels against her father by secretly bringing soup to Kniertje after the shipowner has dismissed her as cleaner because of the rebelliousness of her then still surviving two sons. Clementine would presumably be unable to live an artist’s life without her financial dependence on her father, on her father’s exploitation. Ironically, this inability of art under capitalism to be completely free also shows in the performances of Op Hoop van Zegen. In the 1900 poster announcing the premiere of the play (see top of this blog entry), there is a commercial advertisement for a bakery patronized by higher income categories. And the 2009 performance in Utrecht was on the biggest stage of the city theatre. That biggest hall is called Douwe Egberts hall, as Douwe Egberts coffee corporation is a sponsor. The play is written in a way in which the audience more or less sees the fishing village through the eyes of Clementine Bos. This may be an ironic jab by Heijermans at his audience: in 1900, most of theater audiences were likely to be people with incomes above workers’ wages, as most workers, with exceptions like Louis de Visser, were unable to pay for a theatre ticket. Near the end of the play, Clementine gets a test of what her criticism of her father’s system is really worth. Simon, the shipyard worker, hears that the Op Hoop van Zegen has sunk, with all people on board, from the captain to Kniertje’s last two sons to a 12-year-old boy, drowned. He angrily confronts the shipowner, saying that he had seen that the ship had been a “floating coffin” already before it sailed on its last voyage into stormy North Sea weather. Simon says that he said so then, in the presence of Mr Bos’ bookkeeper and daughter. Clemens Bos asks his bookkeeper to confirm or deny that. The bookkeeper, thinking about his job and career prospects, denies that he had heard what Simon said. Then, Bos asks his daughter. After hesitation, she too lies that she did not hear Simon say that. A central theme in the play is authority. And now, when push comes to shove, Clementine obeys her father’s authority instead of the truth. Immediately after that, Clementine feels very ashamed about her father, and about her lie, but it is too late. Media hired critics often object to socialist works of literature as works where supposedly the characters are made shallow as they represent ideas or social classes in an abstract way; with working class characters supposedly being simple good people; and bourgeois supposedly being shallow bad people. This criticism is certainly untrue for the characters in Op Hoop van Zegen. No-one in the play is an unblemished saint, or a 100% crook and nothing but a crook. As we have seen, maybe Clementine, though from a capitalist family, is the most sympathetic individual of all. But her position in society causes that her good intentions have no possibility of bringing about meaningful social change. Her father, though making money literally over the dead bodies of his workers, as, when a decrepit ship sinks, he will get insurance money, is also ultimately more of a prisoner of capitalism than a prime mover of social evils. On the side of the opponents of capitalism, Simon, the shipyard worker, is not a perfect working class hero. On the one hand, he is an alcoholic. On the other hand, he tells the truth about the Hoop van Zegen ship. The socialist Geert is also not a perfect working class hero. He had joined the navy; and got a medal in the colonial Aceh war in Indonesia. Later, he was jailed, both for beating an officer who had insulted his fiancée Jo, and for reading socialist publications. After going home after six months in jail, he describes his time as a soldier as just “murder”. These rebellious words upset his mother Kniertje much. This brings us to the issue of “nationalism”. In the performance booklet, Hans Goedkoop, biographer of Heijermans, said that lately the question What is Dutch? has come more into the foreground in the Netherlands. Besides Rightist nationalism, Goedkoop thinks, this has also meant positive attention for Dutch cultural tradition material. “If ever there has been a play which one might call typically Dutch, it is Op Hoop van Zegen”. One should note here that Heijermans depicts the Netherlands as a country torn by class conflict; and waging colonial wars described as murderous. Maybe this is why Senegalese fishing community people today consider the play “typically Senegalese”. When Op Hoop van Zegen played in Senegalese fishing towns, the director decided “in the spirit of Heijermans”, to have, after the performances, discussions about the play and about Senegalese fishing industry issues with fishing families, trade unionists and government representatives. This year in the Netherlands, there were no such discussions. One of the reasons for this may be that though Het Toneel Speelt performed the play in scores of Dutch towns, few if any of those performances were in (ex) fishing villages. There were only two try out performances, before the official premiere, in Ijmuiden. Ijmuiden is not far from Wijk aan Zee; and has a more militant trade union history among fishermen than Roman Catholic Wijk aan Zee. Certainly in Utrecht, at least two people regretted that, after the show, they could not discuss the play with the director or with actors. They started discussing it among themselves. However, then they had to leave, as the theatre had to be cleaned. The theatre company Het Toneel Speelt intends to play more work by Heijermans in the future. These two videos are interviews with the director and actors of Het Toneel Speelt about Op Hoop van Zegen. This video is about the burial of Heijermans in 1924. On September 18, 2008, British television’s Channel 4 broadcast The Mona Lisa Curse, a documentary film by Mr. Hughes that offers a devastating critique of contemporary art and its over commercialization: here. Britain: Security Service files released by the National Archive have revealed that MI5 monitored the activities of Irish playwright Brendan Behan but considered him “too drunken” to be dangerous: here. This entry was posted in Economic, social, trade union, etc., Film, Fish, Human rights, Literature, Media, Peace and war, Religion, Visual arts and tagged Heijermans, theatre by petrel41. Bookmark the permalink. Pingback: Blog-aholic Award, thanks Quixote’s Kid! – Schwein gehabt?